The recently delivered 70 metre motor yacht Spectre, listed for sale by Peter Thompsonat Thompson, Westwood & White, has been sold with the buyer introduced by Superyacht Sales & Charter. Launched by Italian yard Benetti, Spectre was built in steel and aluminium to a design by Giorgio Cassetta with naval architecture by Mulder Design and was delivered in 2018. Accommodation is for 12 guests in six cabins comprising two master suites – one with a sea terrace – two VIP suites and two twins. All cabins have entertainment centres, television screens and full en suite bathroom facilities. Special features include a pool, touch and go helipad, elevator to all decks, beach club, spa and gymnasium. 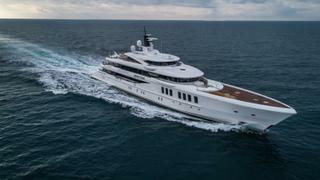 Interestingly, she is the third Benetti ordered by the highly-experienced seller, following Diamonds Are Forever and Quantum of Solace (now Elysium). Spectre is powered by pair of MTU 12V 4000 M93L diesel engines. These deliver a top speed of 21.2 knots and an impressive range of 6,500 nautical miles when she is trimmed back to her cruising speed of 12 knots. For added comfort and safety at sea and in port, she is fitted with Naiad zero speed stabilisers.